Elasticated Shock cord, also known as 'Bungee' Cord. We supply it by the metre or in a bulk 100m plastic reel in 3mm, 5mm, 6mm, 8mm, 10mm & 12mm. 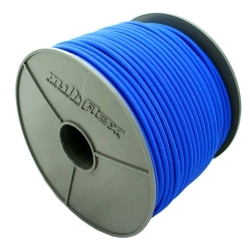 All our Super stretch shock cord has over 100% stretch for best durability. Colours available are black, blue, green, grey, olive green, red, solid white and white with a blue fleck.